REQUIRES EZKEYS This bundle does not include any software. From the turn-of-the-century barrelhouses in the no-name towns of the Southern states to the dimly lit bars of modern day Chicago, Roots Music EZkeys MIDI 6 Pack explores the journey of boogie and the blues. 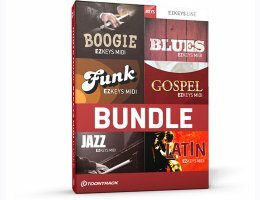 And from the beaches of Copacabana to the smoky bars and well-lit world stages, Roots Music EZkeys MIDI 6 Pack dives into the musical treasures of latin and jazz. And from the persistent beat that echoed through the ’70s and transcended to the power of praise, Roots Music EZkeys MIDI 6 Pack delves into the kindred spirits of funk and gospel. Welcome to a musical journey in the form of piano song structure variations, ready for you to drag, drop and build your own songs from.